Life is busy. What better to look forward to than a holiday, time to reset your mind and rest your body? ‘I need a holiday’ often heard echoed around the workplace, longing for a rest, for time away from work with our friends, family and loved ones, or simply some time to ourselves. Holidays are the welcome reward for our hard work, right? Well, maybe not. Although we all think of holidays from work as a sacred time to savour, it seems that as a nation we are, in fact, squandering time reserved for holidays. 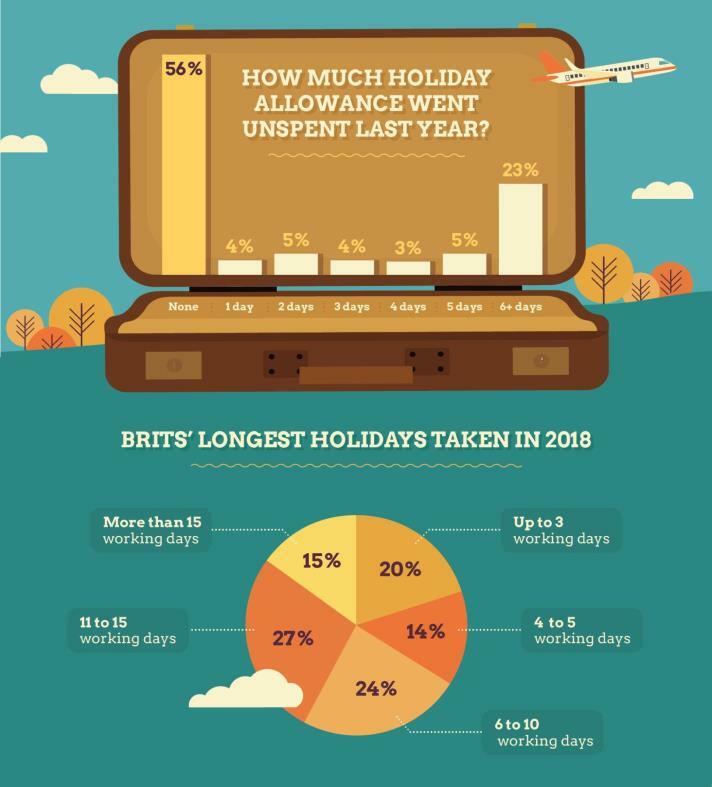 Recent research from tombola has uncovered what’s happening to Brits holidays, as last year 44% of Brits failed to use all of their holiday allowance. In fact, 23% of them still had 5 or more days of holiday left at the end of 2018, which means that almost a quarter of Brits worked an extra week. This does, however, beg the question – why? Why are Brits neglecting to make the most of their relaxation time? The British workplace culture has changed over the years and developed into a relentless, demanding place for many. The culture of working is a fast-paced one with many inputs; face to face, through mobile, text, chat apps and emails. So much so, that tombola’s survey results show that Brits feel ‘too holiday shamed’ to use their full holiday allowance. 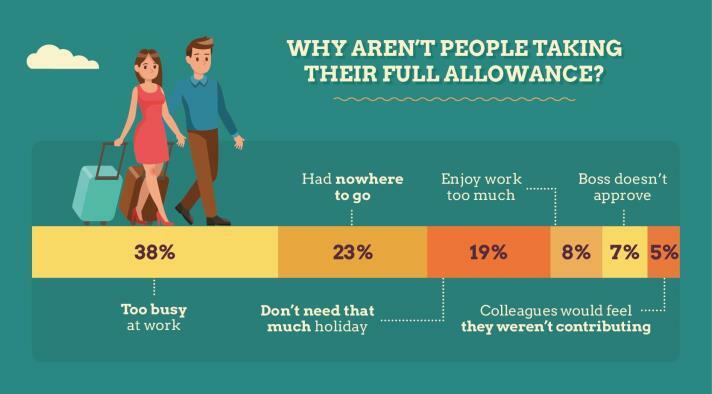 In fact, 38% of Brits disclosed that their reasoning for not taking their full holiday allowance was because they were ‘too busy at work’. This was followed by another 12% who either said their bosses didn't approve or that their co-workers would feel they ‘weren’t contributing’ if they took a holiday. Today, many of us are able to work anywhere anytime, and while this can be convenient, it can also be damaging. Even when we can and are taking full advantage of holidays we’re entitled to, it’s increasingly difficult for many of us to switch off and leave work where it belongs, at work. Increased accessibility allows us to bring work burdens and deadlines with us in the form of mobile phones and laptops. For some this continued interaction can be almost encouraged by employers, 33% of respondents admitted to being contacted by work when on holiday and 44% admitted to checking in with their work emails. Worse still, beyond not taking full advantage of entitled holidays, only 36% claim never to work overtime, leaving 18% working overtime a couple of times a year, 23% doing so weekly and 23% doing so daily! This means that not only are we not taking the time which is owed to us as approved paid leave but that we are also handing over extra time! 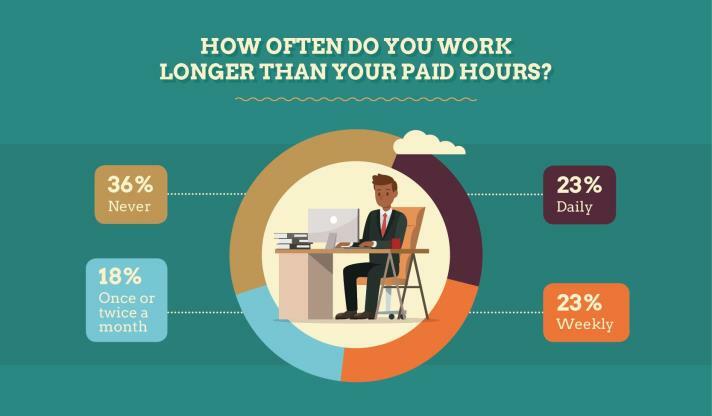 Of those of us who do take the opportunity of holiday during their working year, 20% take no more than three days at a time, little more than a weekend. Why does it matter how few Brits are taking their holiday? Aside from the fact that holiday is an allowance which is not being utilised, it has been found that the longer the holiday we take, the better it is for us. Research undertaken by the University of Helsinki, Finland has proven that taking holidays (and the longer, the better) can significantly reduce stress, one of the biggest killers, which in summary means that taking a holiday can be directly beneficial for our health. With such dedication to the workplace surely Britain must be an incredibly productive place, bypassing holiday for the forwarding of the workforce. 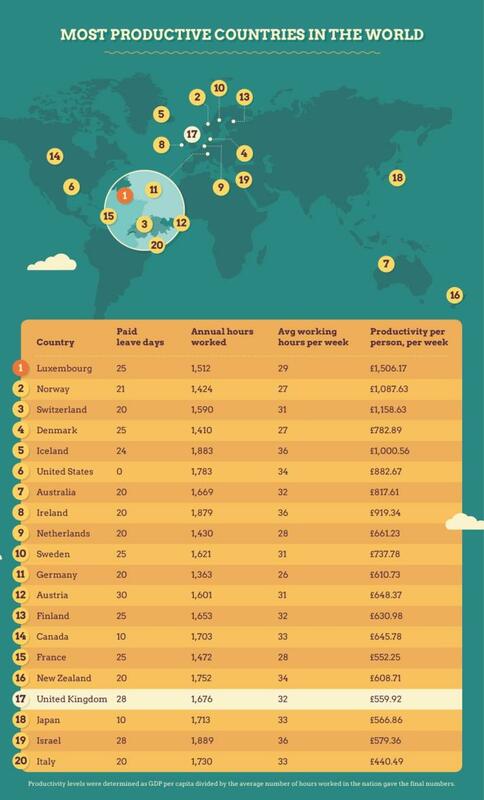 Well, not quite; in a rundown of the most productive countries in the world, Britain comes in at number 17! Further still, these findings proved a correlation between more holiday taken and fewer hours worked and higher productivity. The most productive countries worked fewer hours weekly and took more holiday annually; the top 3 counties working between 27 -31 hours per week and enjoy between 4 - 5 weeks paid holiday. If we’re looking for a role model, Luxemburg could be it, working an average of only 29 hours per week, each employee’s productivity contributes £1,506. 17 weekly to the countries economy. In comparison, Brits work at least 3 hours more weekly, take less holiday and only contribute £559.92 per person per week. It seems that working through our holiday and working overtime too is not actually aiding anyone, not employers, not the economy and not ourselves! Get more productive this year and start taking better care of yourself, utilising the holiday you are given is the perfect place to start. 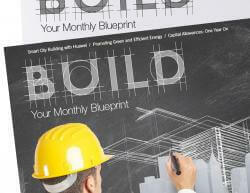 So, go ahead - get planning!